One fear you will encounter when thinking like a fool is the fear of looking like a fool. We make fools of ourselves all the time, so it should be easier than it is. But so many people (full disclosure—me) try so hard to not make fools out of themselves in everyday life (I'm better on stage), that they look foolish trying not to look foolish. But wouldn't you rather look like a fool than be an idiot, if that meant, at the end, you produce brilliance? Of course, if you can do all the foolishness in private, then all other people see is the end result. But it may take a long time for a seemingly foolish idea to be accepted as genius. Stanley Moon: You're a nutcase! You're a bleedin' nutcase! George Spiggott: They said the same of Jesus Christ, Freud, and Galileo. Stanley Moon: They said it of a lot of nutcases too. 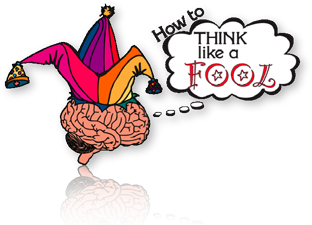 Think: What do I have to do to make a fool out of myself? Is anyone watching? Either way, it's worth it.